Here's some personal observations about engagement and developing online communities, from experience of RSA networks, and other work. My RSA network experience ended in 2013, with some slight further engagement in 2016, so my viewpoint is partial. We could do with other viewpoints in here. The RSA networks vision was far sighted, and attracted a lot of interest at a time that social networks and social media were generating a lot of optimistic buzz. What follows is an attempt to draw out some lessons that may be useful in any further development phase. The context in 2016 is, of course, different from 2007. We have a far wider range of networking tools, and RSA strategy has evolved to provide greater support for Fellows' projects, and encouragement of social enterprise. The question is not so much what comprehensive online network might RSA rebuild, but what what support can RSA offer - online and off - to help Fellows develop their networks and projects, and contribute to RSA strategy. Who “owns” a programme or online community will determine, in large part, how people engage. If it is started and resourced by an organisation, then people may look for an offer, and “what's in it for me”, unless they feel that the organisation is “Us”. Is RCA “Us”? It has never been entirely clear, to me anyway, whether there is one RSA or several … staff, semi-independent research projects, and Fellows. Fellows are often thanked for their financial and other support for RSA activities. They are not members, with ultimate governance rights. The original RSA Networks vision was developed by Matthew Taylor and staff, and promoted to Fellows. Although there was some excellent co-design work in developing the first RSA networks site, this did not extend to later developments. The Digital engagement group was a staff-Fellows initiative aiming for some co-design, but it lacked resources to make substantial impact. Uncertainty about ownership means it is important to establish an engagement stance on the ladder of participation which reaches from information and consultation through to co-design and enabling. What's on offer will determine the nature of control, leadership and facilitation. Promising one stance but acting in accordance with another will destroy trust. The stance and culture of a bottom-up initiative controlled by users is very different from that of an organisational initiative. The test of an engagement stance is who has control. Throughout development of RSA networks it was clear that ultimately staff controlled developments. While there were a number of excellent collaborative events - starting with the November 2007 workshop - development plans rested with staff, with some consultation with Fellows. When non-RSA systems were set up using Ning.com, Fellows were encouraged to help facilitate and support development, and contribute ideas through the Digital Engagement group. However, the decision to close the systems was, I believe, taken by staff, as was the decision not to develop any in-house replacement as a part of new RSA site developments. Wariness on the part of staff about the role Fellows could play - and what access they should have to Fellowship email lists - may have stemmed, in part, from an attempt by a group of Fellows at one stage to change the nature of RSA governance (check date). I think that issues of governance, and changes in systems without consultation, led to loss of trust on both sides. The OpenRSA group developed its own systems - see history - so that it could control methods and content. The original vision for RSA networks, and subsequent development, was established and promoted by chief executive Matthew Taylor. Matthew's original vision was for RSA as a civic innovation network. Fellows were asked to subscribe to this vision - which many did, but some didn't. It wasn't entirely clear at the outset what the main purpose of RSA Networks was - to find Fellows with shared interests, to contribute to a wider RSA vision, and/or to develop civic innovation projects. Projects were the focus of the first system, but there was a lot of talk about networks. See a model for networks below. Because of the RSA's charitable status, there was some uncertainly about whether Fellows could develop non-charitable projects, and how far they could bring their personal business interests into discussion and development. A growing emphasis on social enterprise and projects may now have resolved this issue, with RSA staff taking a flexible approach. I think that Fellows' motivation to engage is in part determined by the nature of the offer: is it help us take forward the vision of a civic innovation network; use a system to develop the projects that you favour; find contacts that may be useful in your business. The purpose, and nature of the offer, also determines how the system should be designed. See models and methods below. One of the key issues in early RSA Networks development was how far any systems would be available only to members. Some of us argued, in setting up OpenRSA, that if the vision was civic innovation, then this couldn't just be done behind a membership login. Others argued that if anyone interested could join in, then the benefits of RSA membership were reduced. In the event, access to the Ning.com system was open, and this appears to be the case with current networks for Sustainability and Re-inventing Work. It wasn't entirely clear during development of various versions of RSA networks where leadership lay, among different RSA departments. The vision came from Matthew Taylor, but implementation of any strategy was less clear. Several issues arose from this: who made decisions on an system developments; who led content development; who managed the systems; who organised facilitation. One of the associated challenges was that in the early days none of the RSA staff had experience of managing and facilitating online communities, and when the Ning systems were being used there was limited support. The Digital engagement group and digital champions were one way to address this, but I believe this ended when the Ning systems were abandoned. Harold distinguishes three main areas of operation, along dimensions of formality and purpose. Social networks - as found on Twitter for example - are informal, not driven by any specific purpose, and useful for chance discovery. Work teams are more formal and purposeful. In between are communities of practice. 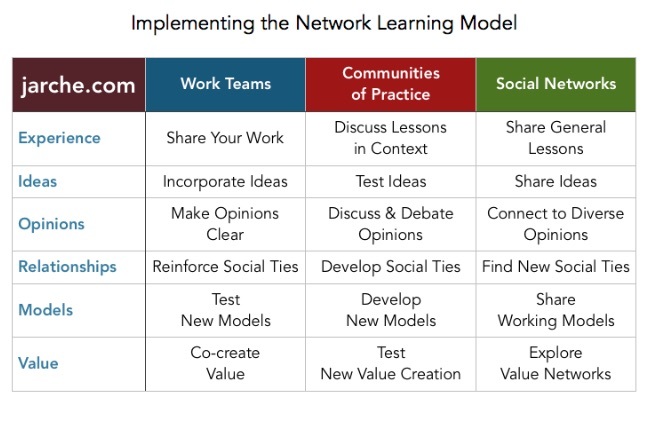 In a further post about Implementing network learning Harold summarises activites in these three areas. What follows from these distinctions is that no one platform or set of protocols will cover all areas: the tools for work teams are not the same as those for social networks. While work teams will want private spaces, the value of social networks stems from their openness. In addition, the skills needed in driving forward work teams may be different from those facilitating communities of practice. Experience of RSA networks and other online systems suggests that it is important to blend face-to-face meetings and creative workshops with phone calls, video conferences and online tools. People need to get to know and trust each other, some people are more confident than other online. We need a range of methods and tools for the three areas of activity described by Harold Jarche. I'm not fully in touch with current RSA thinking, so these suggestions are tentative. At present, to my knowledge, there are two active online networks: The Sustainability network is using Slack and the Re-inventing Work network is using a Facebook group. I'm helping facilitate the Sustainability network, so I'm most familiar with that. These are general suggestions. The nature of the online network will depend on the purpose. If it is social networking, then Facebook and Twitter will be appropriate. If it is development of project-focussed work groups, then Slack is designed for that. The purpose should be reflected in the invitation to join. The element of communities of practice is more difficult, because if these are to work well they will probably need a significant number of RSA Fellows interested in a topic, and also some connection with wider networks. Following from the above, it is likely that any network will need more than one platform or set of tools. The challenge then is integrating activity across tools and platforms. Slack is attractive because it does offer some integration - but is unlikely to be enough on its own. It requires some learning. Facebook may be easier because most people probably have an account and are familiar with it. On the other hand, it isn't really suitable for project groups - although Facebook is now offering Workplace. It may also be necessary to use something like Google docs for collaborative editing of documents, tools for scheduling events and meetups, and video conferencing. If RSA staff manage systems and appear to take the lead in development, then Fellows are less likely to contribute. On the other hand, if RSA staff are looking for substantial input from Fellows it will be important to establish expectations and benefits. Is it a useful learning experience … a chance to make new contacts? In Principles and models for the network era and the Seek > sense > share model Harold Jarche sets out the range of skills we will all have to develop to work in the digital, networked age. RSA networks could be a good place for people to learn these skills - if there is sufficient support. Focus on people first, tools second Online platforms don't create networks. Online communities are seldom self-organising unless there is powerful shared passion. People are reluctant to sign up to another online space. Projects need project leaders, and networks require network leadership and facilitation. Network members may need help in using tools. With so much online content, and potential contacts, people welcome the sense-makers and connectors.